First, prepare your spinach filling. 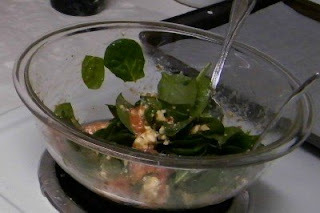 Place spinach in a bowl and add tomatos, feta and then toss with dressing. Set aside. Next, roll out the puff pastry on a lightly floured surface. Cut it into 4 rectangles and work one at a time. Roll the quarter piece until it's thin. You'll have to eye it for size depending upon the size of your salmon.